The credit crunch is beginning to resemble the great electricity blackout of 2003, except in slow motion. On the hot afternoon of August 14 that year, a powerplant in Ohio went out of service. Demand for electricity was high, and the system couldn’t cope. A chain of failures began that cascaded through the network until over 100 stations had to be shut down. Some 50 million people in the North-Eastern United States and Ontario, Canada lost their power. Just before the blackout, none of those people would have been aware that their electricity supply was at risk. When they plugged in their kettle or shaver, there weren’t any warning signs that something could go wrong. It was business as usual. They had no clue that they would be walking home from work that night in the dark, because traffic lights had failed. Our current crisis involves another source of power – money instead of electricity – and another utility – banks instead of power companies. But the dynamic is the same. Until the summer of 2007, banks kept on churning out money and credit to anyone who wanted it. The housing market was getting hot, but no warning bells were going off. Then the market turned, prices dropped, foreclosures rose. Banks got nervous and started charging more for credit, which exacerbated the problem. Then the banks started to fall: the UK’s Northern Rock, then Bear Sterns, Lehman Brothers, AIG. Today’s headline is that the UK building society Bradford & Bingley will be nationalised. As with the 2003 blackout, the credit crunch doesn’t really have a single cause, but was the result of a system-wide vulnerability. What is clear, though, is that the risk models used by banks and financial institutions to price risk, are fundamentally flawed. They assume that the future will resemble the past, and that risks are independent rather than closely coupled. We might never be able to predict such crashes, but at least we can guard against them and reduce their severity by making the system more robust – for example by increasing bank reserves, and limiting credit. And maybe it’s not a bad thing when some banks get nationalised. Banks in the end provide a utility – money – which is created by the government. And when I deposit money in a bank, I don’t care about innovation, I just want it to still be there the next morning. Where is the safest place to deposit money in the UK today? Northern Rock. It’s owned by the government. The U.S. has been accused of practicing disaster capitalism in other countries such as Russia and Iraq – i.e. they exploit social and economic disasters to impose an extreme version of free-market capitalism (see The Shock Doctrine by Naomi Klein). At home, though, it apparently works in reverse. They wait for unregulated financial markets to blow up of their own accord, and then they nationalise the banks and insurance companies and risky assets. In other words: disaster socialism. Do you approve or disapprove of a married woman earning money in business or industry if she has a husband capable of supporting her? If your party nominated a woman for President, would you vote for her if she were qualified for the job? 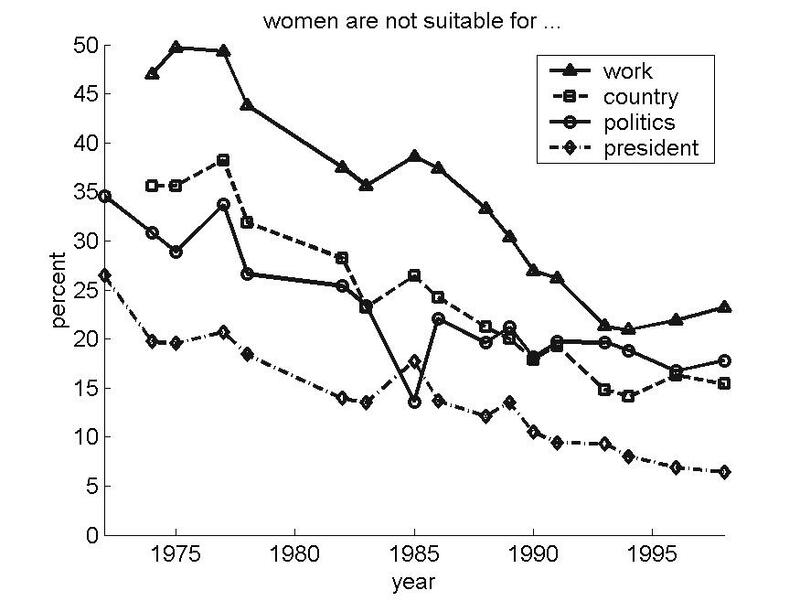 Plot showing the changing attitude to women’s role in the workplace in the United States. Source: General Social Surveys. Since the late 1960s, the number of people who would oppose a woman becoming the first female president in American history (diamond symbol) has decreased by a factor of more than four. Giuliani’s statement is a reflection of this historical shift. So the Large Hadron Collider (LHC) will finally fire up this week, a beam of high-energy protons looping for the first time around its 27 km tunnel deep under the Swiss/French countryside. Once the beam has been tuned, an opposing stream of protons will be sent in the opposite direction, and the two brought together to collide at various experimental sites around the ring. The energy of the collision will recreate, in a somewhat reduced form, the conditions prevalent immediately after the Big Bang. It will be the largest experiment in human history. So what will it find? which if you interpret RAYPOZ as being a beam of protons is enough to get you looking nervously at the sky above Geneva for signs of an emerging black hole. Personally I’m not too worried about that – as I told Coast to Coast AM back in March, we’re constantly being exposed to cosmic rays that have a much higher energy than the LHC beams, and so far no one I know has been sucked into a mini-black hole. A bigger risk, at least for the accelerator community, is that the LHC doesn’t turn up anything too novel or surprising – in which case it will be very hard to raise money for the next big experiment.